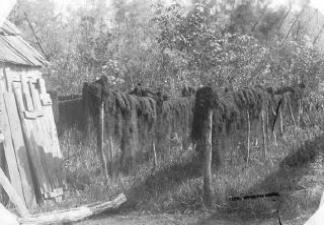 Moss curing, left, on posts, by a moss picker's cabin, possibly near Bayou Lacombe; right, in bundles. 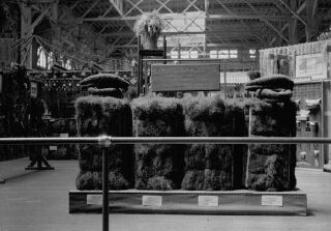 Moss baled in anticipation of being shipped. 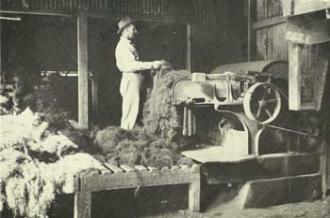 Two moss pickers' cabins in southeast Louisiana, possibly near Bayou Lacombe. moss-covered oak in New Orleans' Audubon Park. 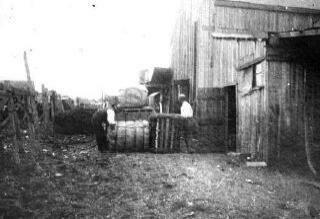 Levee at New Orleans - unloading moss to be placed on steamers. Moss-covered tree near St. Francisville, LA. the ground. Curing took 3 or 4 months. 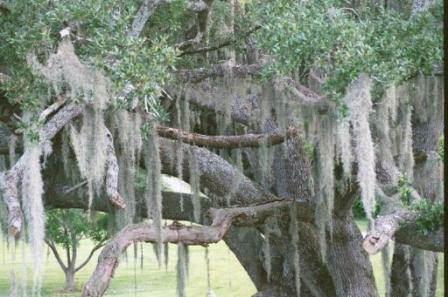 and the same was true of moss found in its walls in 1959.
other forms of pollution have destroyed much of the beautiful Spanish Moss.